I didn’t want this album to happen. Finn’s first solo record after a career’s worth of work with The Hold Steady was simply mesmerizing. The perfect mix of humor, positivity, negativity and acceptance made “Clear Heart Full Eyes” better than any Hold Steady record. Now Finn returns from the triumph with a new album and it seemed there was nowhere to go but down. Finn actually holds his ground with “Faith In The Future” though. It is endlessly interesting in many of the same ways. He has a way of painting a picture with his lyrics that gives a vivid insight to a small piece of a puzzle but he tends to never reveal the whole story. On “Sarah, Calling From A Hotel Room” you never get told exactly what is going on but what you do find out makes your imagination run wild. “Going To A Show” has a repeated chorus making it one of the most intoxicating songs on the album. “Maggie I’ve Been Searching For Our Son” and “Newmyer’s Roof” spit out lines of their stories so fast you’ll find it hard to keep up. This actually helps the record survive repeated listens as it tends to reveal more layers the more you concentrate on certain lyrics. “Christine” is beautiful in its simplicity and is one of many songs completely unique from it fellow tracks on the record. It is a wide sampling that can vary but the record still holds together very well. This album is simply one that you can’t listen to just once, in fact just like Finn’s debut solo album; I just can’t stop listening to it. 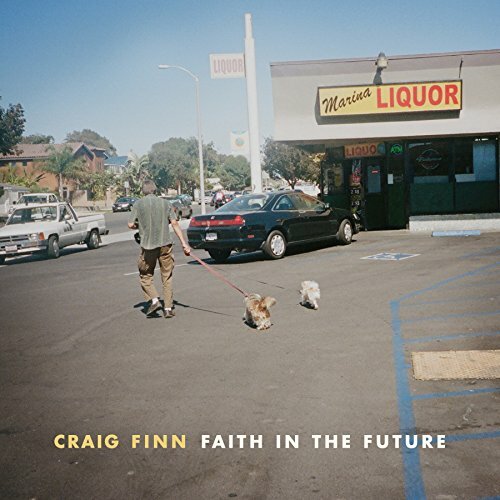 This entry was posted in 250 word album reviews and tagged 250 word album review, 4.5 stars, album review, Christine, Clear Heart Full Eyes, Craig Finn, Faith In The Future, Going To A Show, review, solo album, The Hold Steady, Top albums of 2015. Bookmark the permalink.